Easy for you, delicious for your guests: That's our idea of the perfect appetizer! 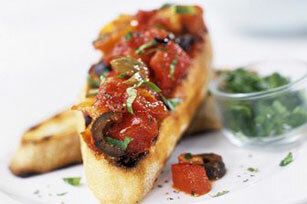 This Roasted Tomato and Olive Bruschetta fits the bill nicely. Cook and stir garlic in dressing in large skillet on medium-high heat 1 min. Add tomatoes, peppers and olives; cook and stir 3 to 4 min. or until heated through. Spoon onto toast slices; top with basil. Preheat broiler. Place whole peppers on foil-covered baking sheet. Broil, 4 inches from heat, 7 to 10 min. or until peppers are evenly blackened, turning occasionally. Place in paper bag; close bag. Let stand 20 min. or until peppers are cooled. Remove peppers from bag. Peel away blackened skins with small knife; discard skins. Cut peppers lengthwise in half; remove and discard seeds. Use roasted peppers as directed in recipe.